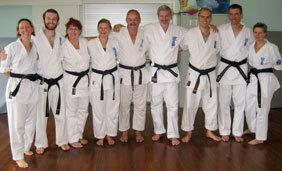 who teaches at Seido Brisbane? 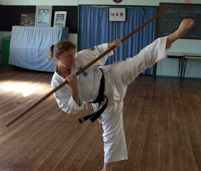 Kyoshi Catherine is a 5th degree (dan) black belt who has been practising Seido karate for 24 years in New Zealand and Australia. As joint head instructor at Seido Brisbane, Catherine takes care of the day-to-day running of the club and works part-time as a counsellor. 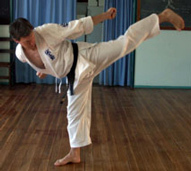 Kyoshi Glyn is a 5th degree (dan) black belt with 24 years experience in karate and has trained in Sydney and Brisbane. Glyn undertakes the role of joint head instructor at Seido Brisbane and works as a real-time solutions manager for public transport smartcard ticketing. Senpai Lea is a 3rd degree (dan) black belt who has had 13 years experience training in karate. Lea also works in the hairdressing profession in which she has been operating her own business for 15 years. Senpai Sam is a 2nd degree (dan) black belt with 10 years experience in Seido Karate. 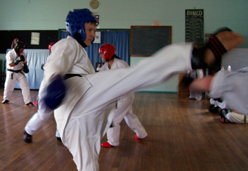 He started training in Seido Karate in New Zealand in 2001 and has trained in Melbourne and Brisbane. Sam works as an accountant in public practice. 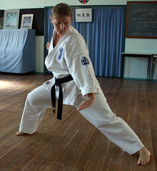 Senpai Leonie is a 2nd degree (dan) black belt and has been training in Seido Karate for over nine years, first in Swan Hill, Victoria, then Melbourne and now in Brisbane. Leonie works as a veterinarian.